The Czech Republic ( Czech: Česká republika) is a landlocked country in Central Europe and a member state of the European Union. The country has borders with Poland to the north, Germany to the northwest and west, Austria to the south, and Slovakia to the east. The historic city of Prague ( Czech: Praha), a major tourist attraction, is its capital and largest city. Other major cities include Brno, Ostrava, Zlín, Plzeň, Pardubice, Hradec Králové, České Budějovice, Liberec, Olomouc, and Ústí nad Labem. The country is composed of two entire historic regions, Bohemia and Moravia, parts of Silesia, and small sections of historic Lower Austria. The Czech Ministry of Foreign Affairs in 1993 suggested that the name Czechia to be an official alternative in all situations other than formal official documents and the full names of government institutions, but this has not caught on in English usage. The official website of the Czech Republic ( www.czech.cz) run by the Czech Ministry of Foreign Affairs does not use the name Czechia as of 2006; its Czech equivalent Česko is disputed by many Czechs, but has been contained in a longer version of the Dictionary of the Czech language of the Czech Academy of Sciences since the 1970s. Archaeologists have found evidence of prehistoric human settlement in the area dating back to the Neolithic era. In the classical era, from the 3rd century BC Celtic migrations, the Boii (see Bohemia) and later in the 1st century Germanic tribes of Marcomanni and Quadi settled there. During the Migration Period of ca. the 5th century, many Germanic tribes moved westward and southward out of Central Europe. In an equally significant migration, Slavic people from the Black Sea and Carpathian regions settled in the area (a movement that was also stimulated by the onslaught of peoples from Siberia and Eastern Europe: Huns, Avars, Bulgars and Magyars). Following in the Germans' wake, they moved southward into Bohemia, Moravia, and some of present day Austria. During the 7th century the Frankish merchant Samo, supporting the Slavs fighting their Avar rulers, became the ruler of the first known Slav state in Central Europe. The Moravian principality arose in the 8th century (see under Great Moravia). 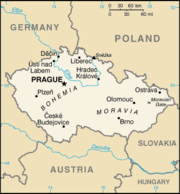 The Bohemian or Czech state emerged in the late 9th century when it was unified by the Přemyslids. The kingdom of Bohemia was a significant local power during the Middle Ages. It was part of the Holy Roman Empire during the entire existence of this confederation. Religious conflicts such as the 15th century Hussite Wars and the 17th century Thirty Years' War had a devastating effect on the local population. From the sixteenth century, Bohemia came increasingly under Habsburg control,as the Habsburgs became first the elected and then hereditary rulers of Bohemia. After the fall of the Holy Roman Empire, Bohemia became part of Austria-Hungary. Following the collapse of the Austro-Hungarian empire after World War I, the independent republic of Czechoslovakia was created in 1918. This new country incorporated regions with majority German, Hungarian, Polish and Ruthenian speaking populations. Although Czechoslovakia was a centralist state, it provided what was at the time rather extensive rights to its minorities. However, it did not grant its minorities any territorial political autonomy, which resulted in discontent and strong support among some of the minorities to break away from Czechoslovakia. Adolf Hitler used the opportunity and, supported by Konrad Henlein's Sudeten German Party, gained the majority German speaking Sudetenland through the Munich Agreement. Poland occupied areas with Polish minority around Český Těšín, while Slovakia gained greater autonomy, with the state being renamed to "Czecho-Slovakia". Eventually Slovakia broke away further in March 1939, allied to Hitler´s coalition and the remaining Czech territory was occupied by Hitler who installed the so-called Protectorate of Bohemia and Moravia, which was proclaimed part of the Reich and where the Protectorate President and Prime Minister were subordinate to the Nazi Reichsprotektor ('imperial protector'). Approximately 390,000 citizens, including 83,000 Jews, were killed, executed or killed in war, and hundreds of thousand of others were sent to prisons and concentration camps or forced labour. The Czechoslovak government-in-exile and its army fighting against the Germans were acknowledged by Allies (Czech troops in Great Britain, North Africa, Middle East and Soviet Union). In 1945-6 almost the entire German minority of pre-War Czechoslovakia, about 3 million people, were expelled to Germany and Austria. During this time, hundreds of thousand of Germans were held in prisons, detention camps, and used in forced labour. In the summer of 1945, there were several massacres with at least 20,000 deaths. Only 250,000 Germans who had been active in the resistance against the Nazis or were necessary for the economy were allowed to stay, though many of them emigrated later. Czechoslovakia uneasily tried to play "bridge" between the West and East; however the strengthening Communist Party of Czechoslovakia took over in February 1948, bringing the country within the Soviet sphere of influence. In August 1968, an invasion by Warsaw Pact troops ended the efforts of the country's leaders to liberalize party rule and create "socialism with a human face" during the Prague Spring. In November 1989, Czechoslovakia regained its political independence through a peaceful " Velvet Revolution". On January 1, 1993, the country peacefully split in two, creating the independent Czech and Slovak republics. The Czech Republic joined NATO on March 12, 1999 and the European Union on May 1, 2004. From 1991 the Czech Republic, then Czechoslovakia, has been a member of the Visegrad Group. The Czech landscape is quite varied; Bohemia to the west consists of a basin, drained by the Labe (German: Elbe) and Vltava rivers, surrounded by mostly low mountains such as the Sudetes with its part Krkonoše, where one also finds the highest point in the country, the Sněžka at 1,602 metres (5,256 ft). Moravia, the eastern part, is also quite hilly and is drained predominantly by the Morava river, but also contains the source of the Odra (German: Oder) river. Water from the landlocked Czech Republic flows to three different seas: the North Sea, Baltic Sea and Black Sea. The local climate is temperate with warm summers and cold, cloudy, humid winters, typified by a mixture of maritime and continental influences. The majority of the inhabitants of the Czech Republic are Czechs (94.2%, this is include Moravians - 3.7% and Silesians - 0.1%; note that most Moravians and Silesians would denote themselves simply as Czechs in the census, regardless of their origins and dialects they speak) and speak Czech, a member of the Slavic languages. Among minorities are Slovaks (1.9%), Germans (0.4%), Poles (0.5%), Roma people, and several others. According to the 2001 census, 59% of the country is atheist, non-believer or no-organized believer, 26.8% Catholic and ca 2.5% Protestant . According to the 2005 Eurobarometer poll, 30% of Czech respondents don't believe in gods, spirits, or life forces, 50% believe in some sort of spirit or life force, and 19% believe in a god . Politics of the Czech Republic takes place in a framework of a parliamentary representative democratic republic, whereby the Prime Minister is the head of government, and of a pluriform multi-party system. Executive power is exercised by the government. Legislative power is vested in both the government and the two chambers of parliament, the Chamber of Deputies (Poslanecká sněmovna) and the Senate. 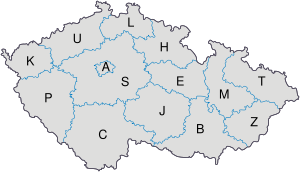 The Czech Republic is divided into 13 regions (kraje, singular - kraj) and the capital city (hlavní město) Prague (Praha). It is further subdivided into 77 districts (okresy, sing. okres). One of the most stable and prosperous of the post-Communist states, the Czech Republic has been recovering from recession since mid-1999. Growth in 2000- 2001 was led by exports to the European Union, especially Germany, and foreign investment, while domestic demand is reviving. The rate of corruption remains one of the highest among OECD countries. Uncomfortably high fiscal and current account deficits could be future problems. Moves to complete banking, telecommunications, and energy privatisation will add to foreign investment, while intensified restructuring among large enterprises and banks and improvements in the financial sector should strengthen output growth. The Czech government has expressed a desire to adopt the euro currency in 2010, but its introduction is only in the early planning stages and there are growing doubts whether budget deficit will not force postponement. The Czech economy gets a substantial income from tourism: in 2001, the total earnings from tourism reached 118.13 billion CZK, making up 5.5 % of GNP and 9.3 % of overall export earnings. The industry employs more than 110,000 persons - over 1% of the population. There are several centres of tourist activity: The historic city of Prague is the primary tourist attraction, and the city is also the most common point of entry for tourists visiting other parts of the country . Most other cities in the country attract significant numbers of tourists, but the spa towns such as Karlovy Vary and Mariánské Lázně are particularly popular holiday destinations. Other popular tourist sites are the many castles and chateaux, such as those at Karlštejn, Konopiště and Český Krumlov. Away from the towns, areas as Český Ráj, Šumava and the Krkonoše mountains attract visitors seeking outdoor pursuits. The country is also famous for its love of puppetry and marionettes. The Pilsner style beer originated in the Czech areas. A smooth crisp beer that major American beers such as Budweiser are based on.